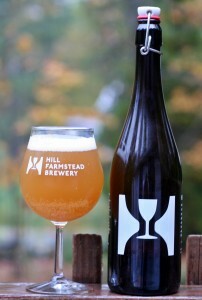 Hill Farmstead is one of my favorite breweries and Imperial/Double IPAs are one of my favorite styles so no surprise that S&S#5 ranks high on my list of favorite beers. Hill’s description of this is “think grapefruit” and that pretty much sums this one up. Cloudy pale gold color with a single finger white head. Aroma is almost all grapefruit with some other citrus notes and maybe a bit of pine. Taste is excellent with tons of grapefruit and just enough malt to balance out the huge amount of hops. With an ABV of 7.8% you might expect to have some burn but there is none here. I took home a 750 and a full 2 liter growler of this beer and went through it pretty quickly. This beer is so easy to drink and very flavorful, really great example of the style and something I could drink on a regular basis and be happy doing so. Brewers Description: Our experimental Double IPA series continues. Imperial IPA. American and New Zealand hops. Think Grapefruit.